Above: Thick smoke from uncontrolled vegetation fires darken the skies on January 22, 2019, in Miena, Tasmania, Australia. 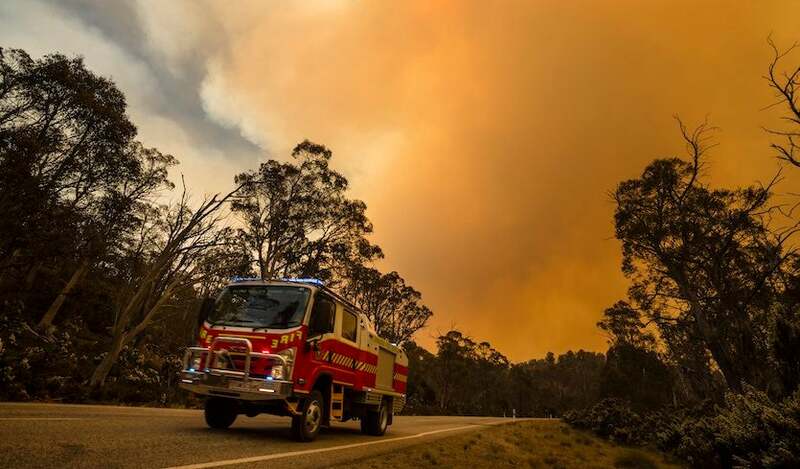 Bushfires tore across more than 205,000 hectares (more than half a million acres) of the island state, including parts of the Tasmanian Wilderness World Heritage Area, during the intense heat of summer of 2018-19. Image credit: Heath Holden/Getty Images. On March 2, 2019, Dover, Tasmania, attained an all-time record high of 40.1°C (104.2°F), the hottest reading ever observed in that Australian state during the month of March. Just the next day (March 4 in the U.S.) a temperature of -46°F was measured at Elk Park, Montana, a new (preliminary) all-time record for cold in that state for March. These two dramatic extremes were exclamation points on what has been one of the most extreme northern-winter/southern-summer pairings on Earth in terms of temperature (in the modern record, of course, extending back a little more than a century). Consider that February brought Western Europe’s most exceptional winter heat wave on record. Although the temperatures were not dangerously hot, the departures from average were astounding. As detailed below, all-time national monthly heat records were measured in the United Kingdom, Belgium, Netherlands, Luxembourg, Austria, Sweden, Hungry, Slovakia, Slovenia, Denmark, Andorra, and San Marino. Meanwhile, all-time (any month) coldest temperatures on record were observed in parts of Japan, Canada, and the U.S., both in January and February. Australia has just endured its hottest summer on record, and in southern Africa, Angola saw its hottest temperature ever measured (any month). In this post, I make an attempt to summarize the temperature gyrations of the past three months. Unless otherwise stated, all of the records cited are heat records. Here is how the climatological northern winter/southern summer played out day-by-day between December 1, 2018, and February 28, 2019. Only records that one would consider “significant” are included (i.e., monthly temperature records on the national scale and all-time records for cities, states, and countries). Since all of the world’s nations except the United States use Celsius as their primary scale, all temperatures below except U.S. records originated in Celsius and are converted to Fahrenheit. Dec. 4: 29.8°C (85.6°F) Kagamihara (Miyakojima Prefecture), Japan. National monthly record excluding Marcus Island. Dec. 4: 33.6°C (92.5°F) Kaohsiung City, Taiwan. National monthly record (former record 32.9°C at Tainan in 1974). Dec. 8: 34.0°C (93.2°F) Praia, Cabo Verde. Territorial monthly record (former record 33.6°C at Praia in 2002). Dec. 22: 37.5°C (99.5°F) Chon Buri, Thailand. National monthly record. Dec. 23: 37.6°C (99.7°F) Karwar, India. Reliable national monthly record (higher and probably-unreliable figures have been reported in the past at other locations and years). Dec. 27: 46.3°C (115.3°F) Skukuza, South Africa. All-time record for any month. Dec. 29: 29.0°C (84.2°F) minimum daily temperature at Bangkok, Thailand. Warmest daily minimum ever measured in December for the Northern Hemisphere. December as a whole: Second warmest December globally on record since 1880. Figure 1. 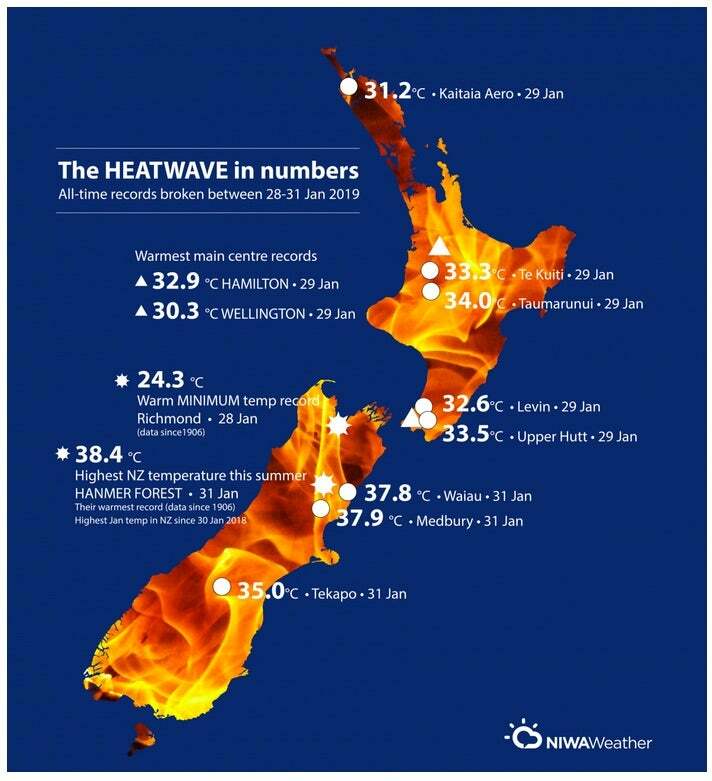 A map outlining the more significant temperature records set in New Zealand during the heat wave of January 28-31, 2019. Image credit: NIWA, the New Zealand meteorological service. Jan. 19: 31.6°C (88.9°F) Christmas Island, Australia. All-time territorial record for any month. Jan. 24: 46.6°C (115.9°F) Adelaide, Australia. All-time record for site. The 49.5°C (121.1°F) at Port Augusta is the highest temperature ever measured on the coast of any ocean in the Southern Hemisphere. Jan. 24: 38.7°C (101.7°F) Namacunde, Angola. National monthly record. Jan. 25: 37.0°C (98.6°F) Pointe des Trois-Bassins, Reunion Island. All-time territorial record for any month. Former record was 36.9°C at Le Port on two occasions. Jan. 26: 36.6°C (97.9°F) daily minimum at Wanaaring (Borrona Downs), NSW, Australia. All-time national high minimum and world record high minimum for month of January. Jan. 26: 38.3°C (100.9°F) Santiago, Chile (Quinta Normal, the city’s official site). All-time record for city. 37.7°C observed at Pudahuel Airport in Santiago as well. Previous record for Quinta Normal 37.4°C on Jan. 25, 2017. Also, Chilean regional all-time heat records were set at Santa Maria (Valparaiso Region) with 42.5°C (108.5°F) and at Huechun (Metropolitan Region) with 41.9° (107.4°F). Jan. 26: 44.0°C (111.2°F) Mariscal Estigarribia, Paraguay. National monthly record (all-time record is 45.0°C at Prats Gill on Nov. 14, 2009). Jan. 27: -46°F (-43.3°C) International Falls, Minnesota, USA. Ties all-time minimum for site (excludes readings from 1909 at different location). Jan. 31: -38°F (-38.9°C) Mt. Carroll, Illinois, USA. All-time state cold record. Also all-time minimum records set at Moline, Illinois (-33°F) and Rockford, Illinois (-31°F). Jan. 31: 38.4°C (101.1°F) Hanmer Forrest, New Zealand. All-time record set here and at 11 other New Zealand sites. January as a whole: Warmest month on record for Australia. Warmest January on record for Bangkok, Thailand (avg. 29.3°C/84.7°F). Third warmest January globally on record. Figure 2. 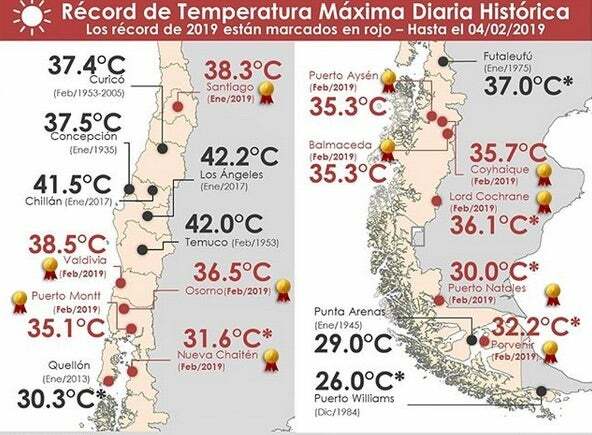 A map summarizing some of the significant temperature records set in Chile during the late January and early February heat waves. Image credit: Meteochile. Feb. 1-4: Chile heat wave breaks all-time records at 10 cities, with temperatures ranging from 35.1°C (95.2°F) to 40.7°C (105.3°F). A 40.7°C at Traiguen is perhaps the most southerly 40°C+ reading ever measured on Earth. Feb. 4: Argentina: 38.2°C (100.8°F) at Perito Moreno, 35.8°C (96.4°F) Rio Gallegos, 30.8°C (87.4°F) Rio Grande. All-time site records (the latter is also a record for the Tierra del Fuego region). Feb. 5: 21.7°C (71.1°F) Sea Lion Island, Falkland Islands. All-time record and first 20°C+ ever measured at site. 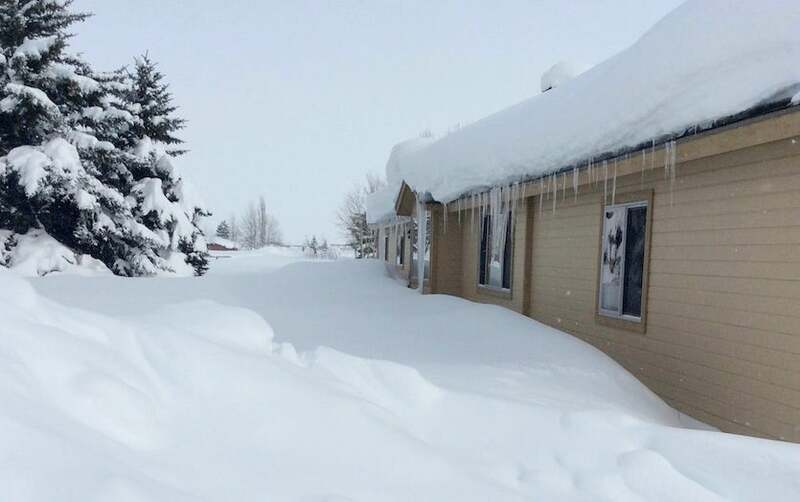 Feb. 7: -46.5°C (-51.7°F) Coronach, Saskatchewan, Canada (near Montana border). All-time cold record for any month. Feb. 8: -13.8°C (7.2°F) Shigeno Inui, Japan. All-time cold record. Feb. 9: -30.7°C (-23.3°F) Lake Akan, Hokkaido, Japan. All-time cold record. Also all-time cold record at Teshikaga (-26.7°C) and Taika (-29.8°C). Feb. 11: -12.6°C (9.3°F) Mauna Kea Summit, Hawaii. Possible all-time state record minimum. Feb. 15: 42.4°C (108.3°F) Traiguen, Chile. New national monthly record. Feb. 16: 41.0°C (105.8°F) Espinheira, Angola. All-time national record for any month. Feb. 17: 37.1°C (98.8°F) Salvador, Brazil. All-time record. This is a very temperate location that rarely experiences extreme highs or lows. Figure 3. 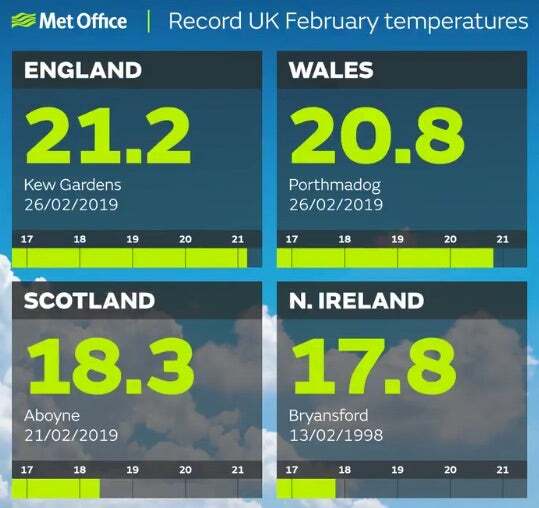 Three of the four member nations of the United Kingdom saw their warmest February temperatures on record in 2019. All temperatures shown are in degrees Celsius. The event brought the U.K. its first temperature above 70° ever recorded during a winter month. At the same time, Los Angeles failed to hit 70°F for the first February since records began in 1878. Image credit: UK Met Office. From February 24 until the end of the month (February 28), much of Europe experienced its most extreme February and/or climatological winter (Dec.-Feb.) heat wave on record. Here is a summary of the national records set. 21.2°C (70.2°F) Kew Gardens, London, United Kingdom. National monthly record and warmest winter day on record. The previous U.K. winter record was 19.7°C at Greenwich Observatory, Feb. 13, 1998. The independent Channel Islands of Jersey and Guernsey also set February temperature records with 18.3°C (64.9°F) and 16.1°C (61.0°) respectively. 15.8°C (60.4°F) Tirstrup, Denmark. Ties national monthly record also set at Copenhagen on Feb. 25, 1990. 16.7°C (62.1°F) Karlshamn, Sweden. National monthly record. Previous record 16.5°C at Vastervik on Feb. 19, 1961. 20.5°C (68.9°F) Arcen, Netherlands. National monthly record. Previous record 20.4°C at Oost-Maarland on Feb. 24, 1990. 22.5°C (72.5°F) Remich, Luxembourg. National monthly record. Previous record 20.0°C at Remich in late February 1960. 26.1°C (79.0°F) Borda Vidal, Andorra. National monthly record. This figure is questionable, but a confirmed 22.5°C was observed at Freda, which would be the monthly record in any case. Previous record 22.3°C at Borda Vidal in Feb. 2011. 24.2°C (75.6°F) at both Gussing and Deutschlandsberg, Austria. National monthly record. Previous record 23.6°C at Bruck an der Mur on Feb. 29, 1960. 23.5°C (74.3°F) Sarver, Hungary. National monthly record. Previous record 22.9°C at Rabagyarmat on Feb. 12, 1998. 20.6°C (69.1°F) Hurbanovo and Ziharec, Slovakia. National monthly record. Previous record 20.3°C at Bratislava on Feb. 22, 2016. 20.3°C (68.5°F) Chiesanuova, San Marino. Ties national monthly record. 24.1°C (75.4°F) Gacnik, Slovenia. National monthly record. Previous record 24.0°C at Vedrijan on Feb. 22, 1990. In Germany, 252 official weather stations (close to half of the nation’s total) broke their monthly record highs during this late February warm spell, although the maximum figure of 21.7°C (71.1°F) at Saarbruken-Burback on Feb. 27 fell short of the national monthly record of 23.1°C set at Jena Astronomical Observatory in 1900. In France, about 91 out of 158 stations broke their monthly records, including a 22.7°C (72.9°F) reading at a site in Brittany, a monthly regional record and similar to what a mid-summer reading would be in this part of France. The average maximum temperature on February 27 was 21.3°C (70.3°F) for the entire country, the warmest February day on record. Norway just fell 0.2°C short of its national monthly record with a temperature of 18.7°C (65.7°F) at Landvik on February 26. Bergen set its February record with a 13.5°C (56.3°F) reading. Figure 4. Maximum temperature anomalies for Europe (degrees C) on February 27, 2019 (left map), and February 28 (right map), two of the warmest winter days on record for the continent. 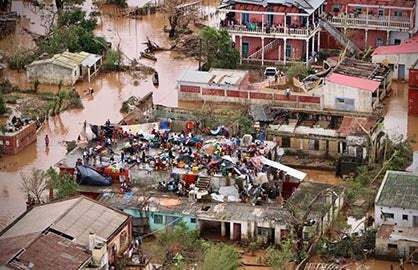 Image credit: ECMWF analysis, ERA-interim, via @gjvoldenborgh and World Meteorological Organization. Probably the most significant weather event of the past winter/summer was how Australia endured its warmest summer on record, with January being its single warmest month ever observed. The average temperature nationally was some 2.14°C (3.85°F) above normal over the course of the entire three-month period December-February. This is an extraordinary anomaly for such a large area and long time period, being about 0.7°C above that of the previous warmest summer on record, which occurred in 2012-2013. BOM has compiled a preliminary summary of Australia’s blazing summer. 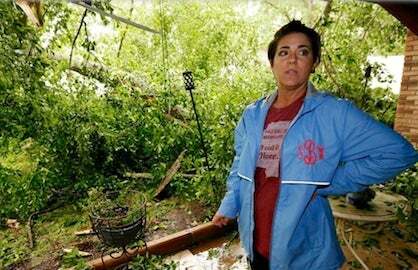 A final detailed summary will be available soon. Figure 5. 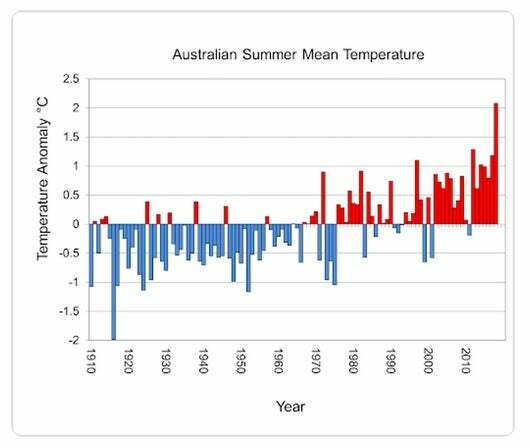 A graph of Australia’s summer mean temperatures since the official record for such began in 1910. 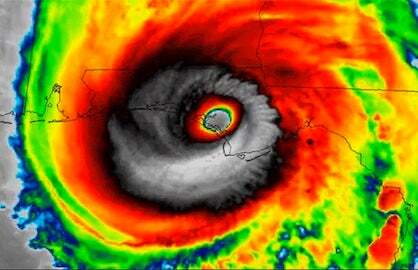 Note the amazing anomaly that this past summer represents. Image credit: Australian Bureau of Meteorology. Figure 6. 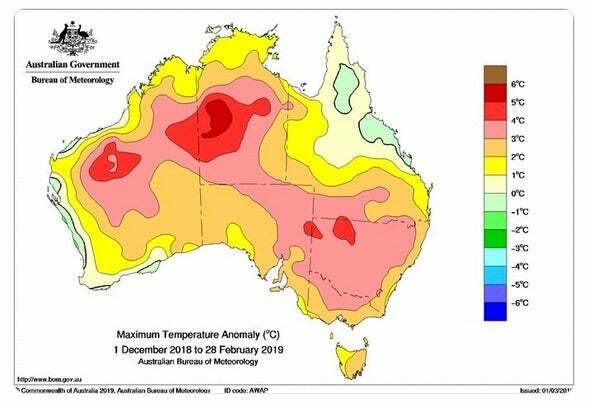 Nearly all of Australia saw well above normal temperatures in the summer of 2018-19. The most anomalous departures were centered over the Northern Territory, where daily high temperatures averaged across the summer were more than 5°C (9°F) above the seasonal norm. Image credit: World Meteorlogical Organization. One thing that looking at all these statistics makes clear is only small portions of the Earth saw any record cold weather this past northern winter/southern summer. The most focused area of cold departures happened to be in the northern United States and southern Canada, where the coldest temperatures since 1996 were seen in portions of the Upper Midwest. February was the second coldest month on record for Montana—but it was also the second warmest February on record for the Arctic region of Alaska and for the southern half of Florida. The point is that one needs to take a global perspective when discussing how climate change may be affecting temperature records. Figure 7. Much of the U.S. experienced an unusually cold and snowy February this year. In Jackson, Wyoming, the official 55.1” of snowfall was less than an inch short of its snowiest month on record (56.0” in December 1969). Image credit: Tim Gallagher. Many all-time (any month) records were set at other locations aside from those listed in this blog. Jeff Masters will have a full list of such in his February global weather summary post, which will be published around March 18. See also the Category 6 global summaries for December 2018 and January 2019. 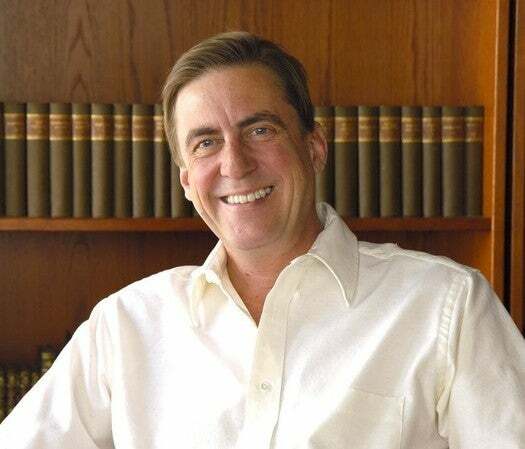 KUDOS: Thanks to Maximilliano Herrera, Jerome Reynaud (Geoclimat), Etienne Kapikian (Météo France), Michael Theusner (Klimahaus, Bremerhaven, Germany), and Blair Trewin (Australian Bureau of Meteorology) for providing the information above on temperature records.